Bangladesh will remain the top garment sourcing destination for global retailers at least for the next five years, and buyers will continue increasing purchase from the country, McKinsey & Company said in a report. During the period, the country’s garment exports will grow 7-9 percent year-on-year, while India and Vietnam will be its nearest competitors, according to the survey report. The survey was conducted among 40 chief purchasing officers (CPOs) of top 40 international garment retailers during January-February this year. Some African countries are also coming up strongly in the global garment business, said McKinsey & Company, which is a global management consulting firm and serves leading businesses, governments, non-governmental organisations, and not-for-profits. purchased $70 billion worth of garment items worldwide in 2014. “For international CPOs, Bangladesh remains the top future sourcing destination, as 48 percent of respondents put it in the top-3 up-and-coming sourcing markets,” according to the report. 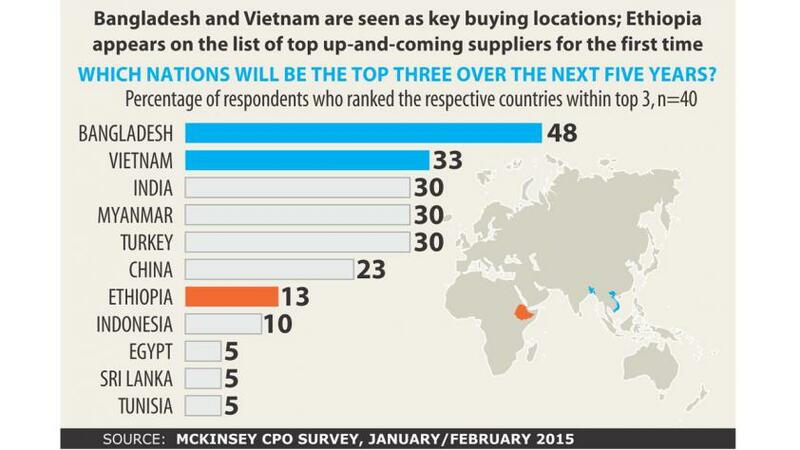 Among top 10 sourcing destinations, Vietnam is in the second position as 33 percent respondents chose this country while, India, Myanmar and Turkey are in the third position as 30 percent respondents chose them as sourcing destination. Twenty-three percent respondents chose China, 13 percent Ethiopia, 10 percent Indonesia, while 5 percent CPOs chose Egypt, Sri Lanka and Tunisia as the top 10 sourcing destinations. Vietnam and India are tied for the third place, each exporting garments worth around $17 billion. Despite high growth over recent years neither country poses a threat to China’s dominance at the moment, as all are facing their individual challenges in terms of political stability, garment industry structure, or competitiveness. Only over the longer term is China’s manufacturing base expected to weaken due to macro-employment trends. A recent report by the McKinsey Global Institute forecasts China’s labour pool could shrink by one-fifth over the next 50 years. But any trend that is expected to play out over 50 years is only just beginning to be visible in the distance, in 2015, the report said. However, nearly three-quarters of the respondents said they expect to decrease their allocation to Chinese firms over the next five years, although export statistics do not reflect the statements of the CPOs. Additionally, China is turning more and more of its apparel production capacity toward its own domestic market, serving its growing middle class. The survey found that many of China’s garment makers are now looking to open facilities in Cambodia, Vietnam, and Myanmar, as well as in other promising countries. The report said the African countries are attractive candidates to be the next China. Although African countries are not ready currently to take substantial volumes, analysis of population trends can point to potential contenders over the longer term. Population trends point toward sub-Saharan Africa, as it is expected to enjoy the most energetic growth in working-age population anywhere over the next 20 years. By 2035, the working population in the region is expected to pull even with China today, the report said. When the CPOs were asked to assess the prospects for the importance of sub-Saharan Africa over the near term, they said they would be sourcing a greater share of their overall portfolio from the region in 2020 than they are in 2015. Granted, the dollar volume exported to western markets at the moment is small, but if those figures are borne out, the sub-Saharan share could grow exponentially in the next five years. Thirty-three US buyers noted the rising importance of sub-Saharan Africa for their own sourcing strategies, while only 11 percent of European CPOs agreed with the rise of African countries as sourcing destination. Of the 28 CPOs already involved in sourcing from sub-Saharan countries, a bit more than half deal directly with local suppliers. Not quite 15 percent source via Asian suppliers’ headquarters, and 32 percent source via agents. The global export data from the World Trade Organisation shows the export value of clothing from the continent as a whole stood at $9.9 billion in 2013, but the majority of those exports came from the countries in North Africa, such as Morocco and Tunisia, rather than the sub-Saharan nations. “If we examine the top-ten garment-exporting nations in sub-Saharan Africa, we see they collectively amount to only a 0.55 percent share of global apparel exports,” McKinsey said. However, many governments in the region are using legislation and incentives to leverage the textile and apparel industries as tools for the broader industrialisation and economic development for some of the least-developed countries in Africa. Bangladesh will face further challenge in global apparel trade, particularly in the US, for the renewal of the African Growth and Opportunity Act (AGOA) as 39 Africa countries have been enjoying duty benefit under the agreement.